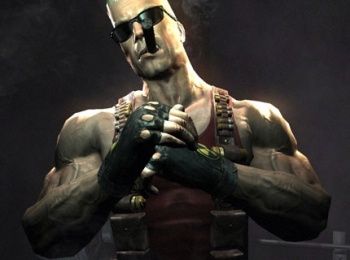 Gearbox CEO: Duke Nukem Forever Is "Exactly Like Half-Life 2"
Randy Pitchford stands by his 2011 statements that Duke Nukem Forever is "awesome". It's been over a year since the long-awaited Duke Nukem Forever finally reached gaming platforms after 15 years of development, where it promptly received one of the most widespread critical pannings our community has ever seen. Perhaps no one was caught more off guard by the reviews than Gearbox CEO Randy Pitchford, who at the time, said the last game he'd enjoyed as much as DNF was none other than Half-Life 2. In fact, Pitchford recently told Eurogamer that he not only fully stands by his Half-Life 2 comparison from last year, he believes that from a gameplay perspective, the two titles are identical. "I don't know if you've played Duke Nukem Forever. It's awesome," Pitchford said. "And it occurred to me, the pacing was exactly like Half-Life 2, where the game would get me in a puzzle space and I would be confined there until I worked out what the components of the puzzle space are. It's basically a linear, narrative experience, but the puzzles are derived from the environment. It's not just 'shoot the guy' ... It's almost identical, beat for beat in terms of its gameplay pacing, to Half-Life. " Pitchford is correct in saying that Duke Nukem Forever has puzzles (they even directly parody Half-Life developer Valve at one point), but the idea that those puzzles are core gameplay elements comparable to those from Half-Life is something many reviewers would have a difficult time accepting. Our own DNF review makes a single mention of puzzles, and that was a specific reference to first-person jumping sections. Valve, on the other hand, has avoided jumping sections since the Xen chapters from the original Half-Life. To Pitchford, a lot of the resentment over the game can be attributed to a combination of high expectations and low-brow humor. "It might be like saying, hey, The Hangover is the exact same movie as Citizen Kane," Pitchford continued. "I thought [The Hangover] was a very entertaining movie and really well constructed from the point of view of how such a narrative can be constructed. But because of its base humor, because of its a pretty easy formula to do and the jokes are really low, it's really difficult, especially for those of us who really wish all video games be elevated into this really high art form." I'm not going to disagree with Pitchford in saying that lowbrow entertainment is still entertainment. I can even agree that certain game elements worked well, such as the ability to interact with level setpieces like urinals, pool tables, and that big whiteboard. That said, level design doesn't seem to be the quality upon which Duke Nukem Forever defined itself. From a design perspective, Duke Nukem 3D is just as playable today as it was in 1996, while DNF was considered out-of-date the instant it was released. Where Pitchford sees the videogame equivalent of The Hangover, the gaming community more likely sees DNF as The Hangover 2.